I do not like Donald Trump, I do not trust him, and I will not vote for him. Clear enough? What choice will you make? OK, please allow me to begin by stating for the record - I do not like Donald Trump, I do not trust him, and I will not vote for him. Clear enough? Now then, this is for all you Republican Trump supporters out there. I am curious to see what your response will be. You are the same folks who demand that we all vote for the Republican candidate in each election. We must, you say, otherwise we will get stuck with a Democrat, and Democrats cannot be trusted. You will understand if I tell you that this attitude leaves me somewhat perplexed, as you are also the same people who tell me that the Republican Party is now no different than the Democrat Party and you do not trust the Republicans anymore. If I continue to scratch my head trying to figure this out I will dig furrows in my scalp. I also hear you demanding that the GOP back whichever candidate that you, the members pick during the primaries. Fair enough. I have always assumed that is the way it should be, but you know what they say about assuming. The same GOP has demanded and gotten a pledge from Donald Trump stating that he will also support whomever the candidate might be. At no time during this entire campaign, however, has the GOP agreed to be held to any pledge regarding the upholding of the Constitution or even the Republican Creed. But, there you are, agreeing to support the guy who agreed to the GOP loyalty pledge. I cannot, for the life of me, understand why anyone would trust either the GOP or Donald Trump, but to each his own. So, it seems to me that there are a couple of possible scenarios at play here. I'm just thinking out loud, so bear with me while I try to explain them. 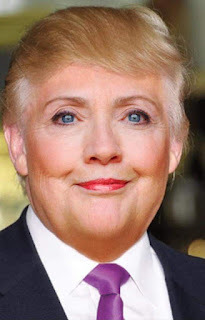 What if Trump does, as many have speculated he will do, and drops out of the race prior to the election (Finding some "legitimate" excuse to do so), as he has had his fill of the attention and fawning that he sought? We know that he is an egomaniacal narcissist and there is every reason to believe that this has all been just another way for him to boost his ego, so what if that does happen? There is also the very real and more likely possibility that the GOP will do to Trump what they did to Ron Paul last election and "change the rules" or find some other way to keep him from getting the nomination, so they can continue with the establishment (Democrat-like) candidates in the party. In either case, for the sake of this possible scenario, he is out of the race and the GOP establishment gets to pick its preferred candidate. Now what? Seriously, now what? What will you do? Who will you vote for? To make it easier for you let us work on the second, more likely, scenario; The GOP finds a way to exclude him. Then the GOP advances its preferred, establishment candidate. What will you do? I apologize for being so repetitive in my questioning, but I want to make sure you get my point. Will you vote for the Republican candidate, no matter who it is? Remember now, if you don't vote for the Republican, whom we can't trust, then we will get a Democrat, whom we can't trust. Is it fine to vote for one untrustworthy person over another, just because he is in your party? In either case don't you get stuck with a candidate that you previously did not like, were not going to vote for, and cannot trust? Well, yeah, Floyd, but at least he's not a Democrat. I have said it before and I will continue to say it until it sinks in; If the GOP suffers no consequences for its improper, dishonest, untrustworthy, and deceitful actions then they will never change their behavior. If you continue to allow them to own you, to own your vote, no matter what they do or how many lies they tell, they will not change. It really is that simple. Why do you not see that? Why do you refuse to acknowledge that basic, simple truth? If you wish to vote for Donald Trump that is your prerogative, but please do not expect the rest of us to compromise our principals just to avoid a Democrat getting elected. There are other choices available, even if it is to write in a vote. At some point you are going to have to decide to show the GOP that they do not own you, that they cannot continue to lie to you, because they know you will vote for them anyway. If you want them to change, to REALLY change, then YOU have to change.